Do you want to sell your car for wrecking and dismantling? Then Melbourne car wrecker may be the best choice due to various reasons. Without wasting any time or putting any effort, car sellers can not only get instant cash for their unwanted cars on same day, but they also get the facility of free towing service as long as you are in Melbourne region. Besides, vehicle transfer paperwork is the responsibility of our team and it is completed by our expert on the spot. To initiate the car selling process, simply get free quotation on your vehicle. After knowing and agreeing to our price evaluation, you can schedule a meetup according to your availability. Payment will be transferred into your bank account or it may be instant cash – depending on the situation. Depending on your situation and circumstances, you can get in touch with us anytime. The first question which everyone eager to ask is about the vehicle price. It is to inform you that car evaluation depending on various factors which include car make, model, age and condition. After carefully assessing the details, our expert put a price tag on your vehicle. Our evaluators has the full authority to give you price from $100 to $15,000. In any situation, car traders get unbeatable price when they compare it to other car wreckers in the area. Melbourne car wrecker is the name of trust and reliability when it comes recycling your car. So, we always pay cash for cars in Melbourne, from old and used to scrap and junk. Free car removal is one of the best and mandatory service. It solve the problem of vehicle towing and collection which save customer’s time and effort. So, whenever you choose Melbourne car wrecker to dismantle your vehicle, our company arrange a free towing service. In other words, this service is absolutely free of cost as long as you are in Melbourne. So, we will collect and tow away the vehicle from your property to our auto salvage centre. We can tow away your vehicle from any property, car park, street or road. We wouldn’t be able to pick up you vehicle it is situated in under cover car park or behind the house. There are many dismantling, recycling and salvage companies in Melbourne. All of them offer same services as Melbourne car wrecker does. But there is a deluge of differences among them. First of all, car wreckers Melbourne is professional and widely experienced dismantlers. We own professional and trained team of wreckers who recycling car, van or any truck in a most suitable way. Second, we are equipped with latest state-of-the-art tow trucks who can winch and remove any kind of car that doesn’t start and drives. We have a large fleet of tow trucks that pick up and collect vehicles from almost all suburbs of Melbourne. Last but not least, we are a well-known company with wide range of used car parts. We keep a huge stock of quality parts and we sell it at a comparatively low price. We have listed our stock on our car wreckers Melbourne website and we update it on regular basis. Our company is not limited to running or late model car. It is our policy to wreck and recycle every vehicle. So, we accept all vehicles, be it Japanese, European, Australian, Asian or American. We evaluate your vehicle on the basis of quality components that your vehicles may contain. Because car wreckers Melbourne, later on, use it for parts, scrap metal, tires, and wheels. We well know and famous car wreckers who not only buy trucks, vans and other non-commercial for disposal but also sell used parts to the public. There is a deluge of benefits of buying parts from wrecking. Whenever you contact our team, just make sure what is the make, model, and badge of your vehicle. You must share all details of the vehicle and part whenever inquire with us. In fact, we have a large fleet of a tow truck that remove and collect vehicle all the day and bring to our different collection centers located in different suburbs. Doesn’t matter how far do you live from our wrecking yard or how bad is the condition of your car. 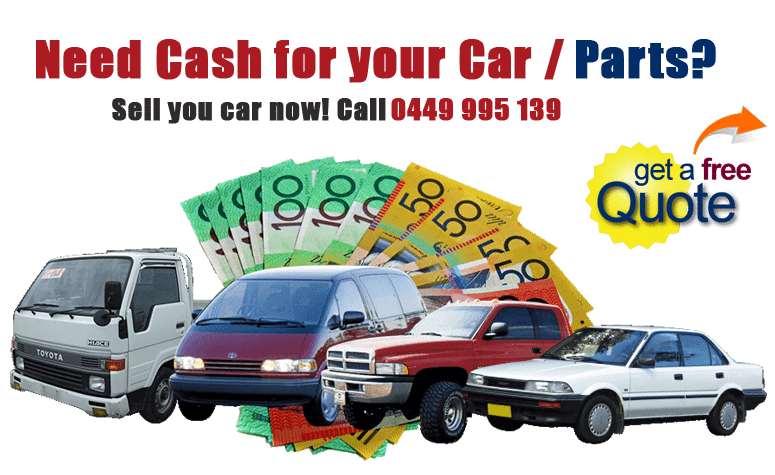 These questions cannot stop Melbourne car wrecker from buying your car.